In Brady’s Rockland studio, bright primary colors and bold geometric forms fill the floor and the walls. Photo courtesy of Alexis Iammarino. There has been a lot of buzz recently about painter Meghan Brady, so not long ago I drove up to Rockland to visit her in her studio to see what all the talk was about. In 2015, Brady was featured in the Portland Museum of Art Biennial. In 2016, she and husband Gideon Bok had a very well-received exhibition at the Perimeter Gallery in Belfast, and she curated the inaugural group show at Able Baker Contemporary in Portland. Then, in 2017, Brady had a two-artist show with Andrea Sulzer at Icon Contemporary Art in Brunswick and was one of the first artists in residence at the new Ellis-Beauregard Foundation in Rockland. It was her residency that generated much of the buzz. I kept hearing from other artists that Meghan Brady’s work had really taken off as a result of being afforded the time and space to work on a larger scale. Brady was so enthusiastic, in fact, about having an entire classroom to work in after having painted in her garage for several years that she has been renting a studio in the Lincoln Street Center since her residency. 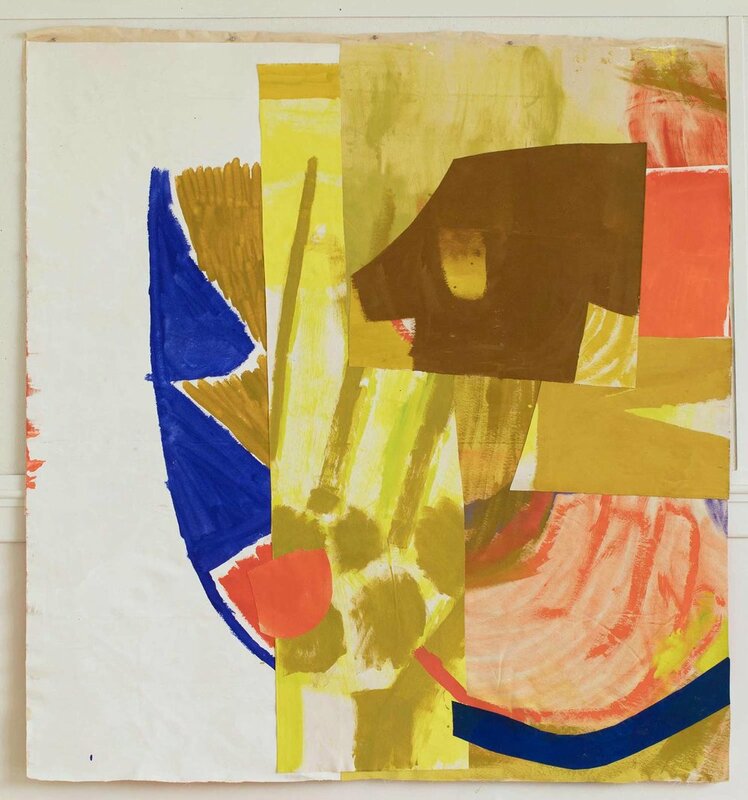 When I walked into Brady’s studio, I immediately saw a dance of bright primary colors and bold geometric forms taking place on the floor and on the walls, a kind of visual pas de deux between abstraction and representation. The imagery, when it coalesced as such, had a human dimension but more vessel than visceral. Indeed, there is something free and childlike about Brady’s big, colorful paintings. The ambition is a function of size, not tabletop but wall size, floor size. BIG. The humility is expressed in the elementary palette, unstretched canvases, and sheets of cut paper on which her works are painted. These loose, wild, friendly paintings are not afraid to be playful. Brady working on her show Free Forming at Tiger Strikes Asteroid in NYC, April 2018. Photo courtesy of Alexis Iammarino. Photo courtesy of Alexis Iammarino. Brady’s new paintings will be featured at the University of Maine Museum of Art in Bangor (January 11 to May 4, 2019) as one of three concurrent solo exhibitions, the other two featuring Brunswick artist Richard Keen and Boston artist Zach Horn. Brady, 43, is the mother of two little girls, Helen and Ada. She and Gideon Bok, also a painter, live in Camden, where Bok helps run his family’s farm and Brady commutes to her studio in Rockland. Last winter, the entire Brady-Bok family took part in Circle Time: Children and Their Artists, an exhibition of work by artists and their children at Able Baker Contemporary. The artists Brady feels close to in Maine include her husband, Elizabeth Atterbury, Karen Gelardi, Anna Hepler, Cassie Jones, Kayla Mohammadi, Mark Wethli, and John Walker. She is also a great admirer of painter Katherine Bradford. She says Bradford’s recent large figure paintings, which she saw at Canada, a gallery in New York last fall, inspired her with the way Bradford seemed to have discovered a magical frequency where images work naturally at scale.